Christian Lebrat is one of those remarkable people you don’t meet everyday. The filmmaker Giovanna Puggioni, Lebrat’s wife, welcomed me into their home in the 9th arrondisement in Paris where I sat with Lebrat in their living room surrounded by books on art and cinema. I listened to his story. I was impressed by his courage and willpower, by his passion and intelligence. It demands an outstanding personality to contribute to the cultural scene in the dedicated way that Lebrat has for the last 20 years. He has almost single-handedly made literature about avant-garde and experimental cinema and its auteurs accessible to the general public through his specialized publishing house. In 1983, together with Prosper Hillairet and Giovanna Puggioni, Lebrat created Paris Expérimental (1), the first publishing house dedicated to experimental cinema ever to exist in France and probably anywhere in the world for that matter. There was very little written trace available in France dedicated to the extraordinary work and achievements of French and international avant-garde and experimental filmmakers, whether living in France or abroad. Almost no texts were published or translated from other languages about this art. This was a cinema genre that was unknown to the general public. Except for a couple of festivals in France (2) and some theoretical classes in the early 1970s, by teachers at St Charles University (Sorbonne Paris 1, created after the 1968 political events in France) and the University of Vincennes (3), this form of cinema held no established place in the cultural heritage of the 7th art. I was curious to know all about the trajectory that had led Lebrat to creating his publishing house; there was no precedent in this field and I knew that he had no financial support for this. He has published more than 40 books up until today. He has kept his publishing house alive with the desire and curiosity to publish more books of artists and authors he admires. People have also sent him manuscripts that he publishes as he finds them of value to this field. Lebrat is now, at last, receiving more recognition for his work (his books are in libraries, specialized bookstores and are used for reference in research at universities). He has begun receiving grants to publish some work. I was eager to find out where the will to do this had come from and settled on the floor near my tape recorder ready to spend a few hours on this journey. Both my mother and my father came from very humble social backgrounds. My mother came from the countryside. My father had been abandoned by his single mother, brought up by his grandmother and later put into a reform school. His life was destined to be a failure. Instead, he worked himself up the social ladder, paying for his own studies and evolving from being an accounting clerk to an accountant to finally becoming a Certified Public Accountant. He loved to dance and loved music, especially jazz and swing. A self-made man! This is quite phenomenal in the French social class dynamics. Yes. As soon as he got out of reform school, he decided to join the Navy, where he learned the notion of discipline. He also became a Sunday artist, painting seascapes. He would exhibit them around our home; we bathed in his creative energy. He was a believer in resistance and revolt, as society had not spared him. My father once took my sister and I to visit the occupied Sorbonne University during the 1968 events! He wanted to see with his own eyes and show us the youth who where revolting against the system. At home, we listened to and analysed the news on the radio around these events. I make the films I want to see and, as a publisher, I publish the books I want to read. I conceive publishing as an act of resistance, in complete independence. Can we speak about your artistic work as I feel that this led you to your work as a publisher? The image of a father who decides to make it, and does, must have been a strong determining factor for some of the choices in your life. I’m sure it was. I worked at the same time as I did my studies. I worked as a cleaner at the printer’s where my stepfather worked. It wasn’t easy, that’s for sure, but a few months there enabled me to go without working for some months and be free to do whatever I wanted. I wanted to be free and independent. Society was not that easy; it was quite radical and one had to find solutions alone. It’s true in a way one became more inventive and this reflected in the work we did. As I grew up, I went to the museums alone every Sunday and learnt about painters and painting, which was and still is a very important part of my life. So, when I decided to choose an arts program and stop the math course I was doing, it was probably not out of the blue and I was supported by my parents. Did this choice bring what you expected? Things started taking shape and meaning in my life from then on. Everything happened more or less simultaneously. In 1974, I was given an 8mm movie camera by a friend and I began experimenting with it using Kodachrome film. While I was making my films, I was still going to the film theory class given by Dominique Noguez. Simultaneously, I participated in the founding of the Paris Film Co-op [a distribution co-operative for experimental films] and I enrolled at a second progressive university, Vincennes, where I met other teachers such as Claudine Eizykman and Guy Fihman, with whom we shared æsthetic views around our filmmaking. We would show one another our films and talk about our ideas. While Noguez spoke mainly about theory, these teachers and filmmakers practiced structural cinema and the American movement. I became a part of the Melba (5) magazine group [1976-1979] with them and began to write my first articles about films. At the same period, I met my wife, Giovanna Puggioni, who supported me in my work and who began to make films herself. Who influenced you the most in your work as a filmmaker? The 1976 event in Paris, “A History of Cinema”, was curated by one of the most important avant-garde filmmakers, Peter Kubelka. There, I was able to follow the history of avant-garde cinema and discover amazing films. Peter Kubelka became my reference point. As a matter of fact, it was because of this event that the Centre Georges Pompidou bought its first film collection and, also because of this, built a cinema theatre, even though it was not in the original plans. That is how I got the job there as projectionist for a few years. After “A History of Cinema”, I became extremely curious about this form of cinema. Being a projectionist allowed me to watch films non-stop, meet filmmakers and listen to them speak about their films. I was able to go to the exhibitions there as well, and all for free! I began to love the film production of some artists like Paul Sharits, Michael Snow, Ernie Gehr. I adored Kubelka’s films. I found it so outrageous that no book had ever been published anywhere about this pioneer of avant-garde cinema that I decided to publish a book on his œuvres myself a few years later. This became the first book in my collection, “Classiques de l’Avant-Garde”. I managed to get a small grant from the CNC [Centre National de la Cinématographie], which enabled me to invite him over for a retrospective of his œuvres, for the publishing of the book and the book signing. When did you actually find a form of identity in your films? The 1970s were a very rich time in experimental film; we discovered but also invented lots of new forms. But maybe my true æsthetic shock came when, in 1974, I went to a retrospective exhibition of Rothko at the Grand Palais. I remember staying in front of his paintings for hours and came out literally changed. 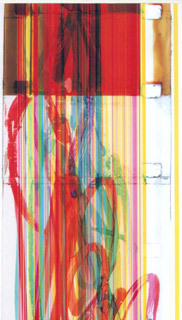 My film work from then on was focused around colour and vibrations. “Vibrations” is the title of one of my texts written in 1990 on the occasion of my films showing in Australia. Since I began making films I have always been interested in the fact that the image in cinema – the image on the screen – does not exist at all. It is an immaterial image: you cannot touch it, it’s only light, projected light. You continued making films after University? Two years after finishing my doctorate in 1980, I finished my film Holon, one of my most important works with colour; then I made a black-and-white film, a kind of a ready-made sound film called Le Moteur de l’action , which ends the first part of my filmography. I stopped filming for years, working mainly with photography, and spending a lot of time publishing books. Recently I’ve returned to filmmaking and video with performances like Ultra and video installations like V1 (Vortex). Cinema is magic. You can obtain visual effects with cinema that are impossible with any other medium. And the magic of cinema is very strong – look at Méliès, for example. Is filmmaking an important part of yourself? I think we “are” through film. You invent the expression of yourself, of who you are. My way of working was very radical, just like society was then. I decided to work only with colour. It was a constraint, a challenge, too. I wanted to make films as revolutionary as Kubelka’s or Sharits’ films! Are your films are a kind of materialization of yourself? Yes, that’s a good word to use. Do you consider your film work and your publishing work to be a continuation of each other? I don’t consider my films to be a source of transmission as I do my publishing. I make my films to project myself and I think people can project themselves too. My work as a publisher is a way of helping others find out about all these great filmmakers and theorists. I never decided to become a publisher – that was fate – but I had decided to become a filmmaker. Let’s talk about how your publishing house, Paris Expérimental, was created. In the ’80s, experimental cinema made with film was almost extinct. In France, video technology came into the scene and took over. Museums, galleries and schools were teaching this new technology. This was also the case for publications dedicated to experimental film; there were very few writings around the subject. There was the need to fill in that empty space by publishing important founding texts such as those by Germaine Dulac, Jonas Mekas … Books and essays which had been written on the subject in English, such as those by P. Adams Sitney (9) and Standish D. Lawder (10), books by Dominique Noguez (11) and monographs on pioneers of cinema, such as Peter Kubelka, Kenneth Anger and Stan Brakhage, needed to be published. The desire to share my passion about this form of cinema, which I place at the pinnacle, gave me the incentive to organize large events around it. The first being, in 1985, as I worked at the Centre Georges Pompidou, I suggested a retrospective including experimental cinema, Nouvelle Vague films, Nouvelle Narration, poetic documentary. It was to be called “Paris as seen by avant-garde Cinema”. (12) In this way, we could include our own films which were never shown and by introducing them in official and large events they had a chance to be seen. This, in fact, was the very reason for my first retrospective. There was no money to publish a catalogue for this event and, as I wanted a trace, I decided I would publish it myself and thus created my publishing house. I invested my own money and did it. I went on to do other events such as the first-ever Jonas Mekas retrospective in France at the Jeu de Paume Museum in 1992 and published “Movie Journal” in a French translation [Ciné-Journal] of his chronicles published in Village Voice. This contributed very largely to the discovery of this immense artist in France. My desire was to get these events and books made in a very artisanal way. (13) We were exactly like real publishers but there was no staff, no infrastructure and no money. In the beginning, no one was paid except for the printer, of course. As I said, my stepfather worked at a printer’s – he was a photo engraver – so he helped me a lot. My wife, Giovanna Puggioni, designed the covers and I did the editing and all the rest. In return, the authors received a number of copies. I always tried, when it was possible, to publish a book in conjunction with an event. I won’t be able to spend much time organizing events but I will continue to print the books I like to read. I have just published a book on the Zanzibar constellation by Sally Shafto, also a large work on the Lettriste artist Maurice Lemaître and the final issue of Cahier de Paris Expérimental about contemporary cinema and abstraction, “Cinéma et abstraction” by Raphaël Bassan. At the moment, I am working on assembling my writings. I have texts and articles about Man Ray, Mekas, Kubelka, Robert Breer, Maurice Lemaître … for a compilation of my writings in a book which I will call Pour le cinéma radical. Sharing information and knowledge through the written language is a form of communication I like. I have a feeling also that if I don’t continue publishing about this cinema form, not many people will, but I don’t want to spend all my time on that. I also need to continue my photography and my films and videos. Festival du film de Hyères and la Biennale de Paris. Dominique Noguez, Claudine Eizykman and Guy Fihman. 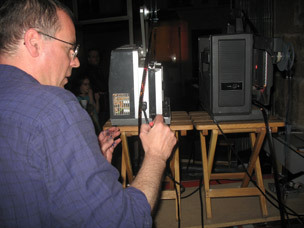 Christian Lebrat wrote his doctoral thesis on his own films. In the mid-1970s, a group of young filmmakers studying graphic arts (Dominique Willoughby), fine arts (Pierre Rovère, Jean-Michel Bouhours, Christian Lebrat) and film theory (Prosper Hillairet) founded, with two film professors at the Université de Vincennes, Claudine Eizykman and Guy Fihman, Melba magazine (5 issues were published between December 1976 and February 1979), in which they wrote about their theories on cinema. 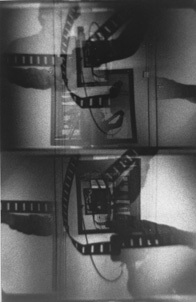 Influenced both by the radicalism of Peter Kubelka, whose works they admired, and the philosophical theories of Jean-François Lyotard (Libidinal Economy and Désirs Energétique), they produced films of visual intensity, composed of metamorphoses and interweaving of images, both in and against the current of American structural cinema. In the early 1980s, the group dispersed and some of the members went on to make their best films. Vibrations excerpts are from a lecture Christian Lebrat gave throughout Australia (Perth, Adelaide, Canberra, Melbourne, Sydney) in November 1990. Published in Cantrills Film Notes, no. 65-66, October 1991, pp. 56-8. Also published in the book written by Christian Lebrat, Entre les images (Paris: Paris Expérimental, 1997). P. Adams Sitney, Visionary Film: The American Avant-Garde 1943-1978 (New York: Oxford University Press, second edition, 1979). When the English publisher found out that a French version and revised edition of the book was being published in 2002, he decided to republished the English edition in English. Standish D. Lawder, The Cubist Cinema (New York: New York University Press, 1975). Dominique Noguez, Eloge du cinéma expérimental (Paris: Éditions Paris Expérimental, 1999). Originally published in 1979 by the Musée National d’Art Moderne, Paris. “Paris vu par le cinéma d’avant-garde 1923-1983”, organized with Prosper Hillairet et Patrice Rollet, Centre Georges Pompidou, 1985. Very important events and books are Nicole Brenez, Christian Lebrat and Collectif, Jeune, dure et pure! Une histoire du cinéma d’avant-garde et expérimental en France (Paris: Cinémathèque Française, 2000), Cinéma visionnaire: panorama du cinéma expérimental américain (Forum des Images, Paris, 2002; Filmstudio, Rome, 2002), Dimension Lemaître: Maurice Lemaître et le cinéma (Festival Côté Court, Pantin, 2005) and Montage Lemaître : Maurice Lemaître et le lettrisme, poésies et films (Marché de la Poésie, Paris, 2007).